Triple Tour de France winner Alberto Contador has today lost one of those titles, with the Court of Arbitration for Sport in Lausanne stripping him of his 2010 victory plus his 2011 Giro d'Italia title and handing him a two year ban. Contador tested positive during the race and, after a long, drawn-out process which has taken over a year and a half, CAS has ruled that he will forfeit one of those yellow jerseys plus the Maglia Rosa, as well as other results achieved since the 2010 Tour. Today’s decision marks only the second time in Tour de France history that a race winner has been disqualified for doping. The 2006 winner Floyd Landis was the first. Luxembourg’s Andy Schleck will be confirmed as the Tour winner, stepping up from the second of his third consecutive runner-up slots. The CAS website was jammed for quite some time this morning due to the number of readers trying to access the judgement. It has since issued a statement about the case, and ruled that it considered a contaminated food supplement was the most likely source of the positive test. It discounted the argument of Contador’s legal team, namely that steak was the reason for the positive, and also said that WADA had not successfully shown that a blood transfusion could have put Clenbuterol in his system. “The Panel concluded that both the meat contamination scenario and the blood transfusion scenario were, in theory, possible explanations for the adverse analytical findings, but were however equally unlikely. In the Panel’s opinion, on the basis of the evidence adduced, the presence of clenbuterol was more likely caused by the ingestion of a contaminated food supplement,” it stated. That two year period runs from January 25th 2011, the date the RFEC initially proposes suspending him for a year. However it deducted the time prior to that when he was provisionally suspended, meaning that he will be able to return to competition on August 5th 2012. The UCI has acknowledged the verdict, stating that a lengthy ban has been imposed. “In rejecting the defence argument, in particular that the presence of clenbuterol in Alberto Contador's urine sample came from the consumption of contaminated meat, today's ruling confirms the UCI's position,” it stated. “However, the UCI has not derived a sense of satisfaction from the CAS ruling, but rather welcomes the news as the end of a long-running affair that has been extremely painful for cycling. The UCI added that it would not comment further. In addition to the Tour and Giro titles, Contador will also lost out on a range of results from 2011. These include two stages plus the overall in the Vuelta a Murcia, one stage plus the overall in both the Volta a Catlunya and the Vuelta a Castilla y León, plus two stages and the final pink jersey in the Giro d’Italia. 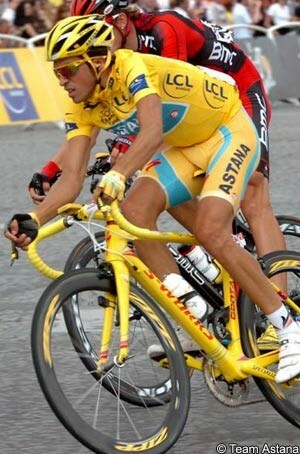 He was also fifth overall in the 2011 Tour de France, and loses that result. The Spaniard won the 2010 Tour de France by the narrow margin of just 39 seconds, coincidentally beating Andy Schleck (Saxo Bank SunGard) by the exact time that he gained over him when the Luxembourg rider dropped his chain on stage 15. The victory was however called into question when, hours before the world time trial championships on September 30th, Contador’s spokesman issued the shock news that the rider had tested positive on the Tour’s second rest day. It later emerged that announcement may have been prompted by questions asked of the UCI by German journalists, who had been tipped off that Contador was positive. The Spaniard and his legal team denied doping and said that the traces of Clenbuterol found in his system were due to food contamination of beef bought in the border town of Irun by a friend and brought to the Tour. Although European Union statistics deemed this unlikely, the Spanish Federation RFEC ruled in his favour. Having initially proposed a year’s ban, it then announced a final decision that the rider would be cleared without any sanction. Both WADA and the UCI appealed against this to CAS, expressing concern at possible political interference. Contador continued to race and took several victories, including the 2011 Giro d’Italia. The hearing was expected to take place in July but a delay occurred and enabled the rider to take part in the Tour de France, where he was fifth overall. The case was finally held between November 21st and 24th. CAS stated afterwards that it would take approximately six weeks for a decision, but this timeframe ultimately proved inaccurate. In early January Flavio Becca, one of the main backers of the RadioShack Nissan team, questioned the Saxo Bank team’s actions after the CAS hearing. Noting that the Chairman of the CAS panel was Israeli, he suggested that the team’s decision to hold a training camp there looked like an attempt to influence the outcome. One of Becca’s riders is Andy Schleck, the rider who stood to inherit the 2010 Tour victory if Contador was disqualified. On January 11th the Associated Press reported that WADA was unhappy with how the trial had played out, stating that unnamed participants in the hearing had told it that a key witness, anti-doping scientist Michael Ashenden, was blocked from being able to give evidence. It is thought that he was to be called in order to boost the hypothesis that a blood transfusion might have been the reason for the Clenbuterol in Contador’s system. According to AP, WADA considered walking out in protest. Both WADA and the UCI moved to play down the story afterwards. “At no stage did WADA challenge any member of the panel for a lack of independence,” stated the former, although the clarification didn't address many of the points raised by the piece. The UCI gave its full backing to CAS, saying that it was satisfied that the court was fully impartial, and that none of its representatives had leaked information. Despite that, CAS announced on January 16th that the case decision had been delayed due to what had happened. “The Court of Arbitration for Sport (CAS) has noted with great disappointment that some media have reported certain rumours in relation to the arbitration procedure involving the International Cycling Union (UCI), the World Anti-Doping Agency (WADA), Alberto Contador and the Spanish Cycling Federation (RFEC),” it wrote. It said then that the ‘regrettable incident’ had delayed the work of the panel and that a final decision would come during the week of 31 January 2012. That was further delayed until today. In the meantime, Contador competed in the Tour de San Luis in Argentina. He won two mountain stages and finished second overall, 46 seconds behind Levi Leipheimer (Omega Pharma-Quick Step). He also competed yesterday in the Trofeo Palma, part of the Challenge Mallorca series of races. He placed 98th there, then flew back to mainland Spain to await the CAS decision. Today’s ruling might not mark the end of the matter, with appeals about the handling of the hearing still possible.